Cooking for poor poets and others: Designer Ice Cubes | when is a party not a party? An important ingredient in cocktails and mixed drinks sometimes gets overlooked, even by bartenders—the right ice. Noble W. Harris, general manager of the Manhattan restaurant The District Tap House, believes ice is the cornerstone of any mixed drink. It can help mold and change how we experience a cocktail, from the first sip to the last. It provides more control over “how the flavor will react throughout the whole drink, not just in the first sip,” he says. Size is important. The larger the ice, the less diluted a drink gets. This is especially important if you’re a slow sipper. A drink can be “the perfect temperature for one minute, but from then on, it’s getting less cold and more room-temperature, and it’s effectively not as good,” Mr. Harris says. “You get into a conversation and your drink becomes warm and it’s not nearly as delicious.” A large piece of ice will melt slowly and keep the drink nicely chilled longer, he says. 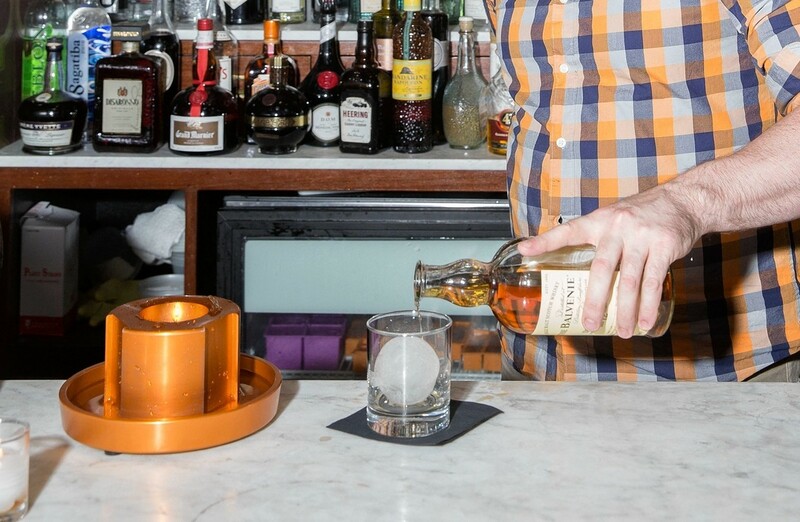 Big spheres of ice that fit snugly in a squat lowball glass work well with drinks that taste better after sitting for a while, such as a Manhattan, an old-fashioned or a little Scotch, Mr. Harris says. The ice won’t melt too quickly as the drink breathes. They’re “also really nice to look at,” he notes. Store-bought silicone ice molds can be used to make different shapes. For tall, narrow Collins or highball glasses, Mr. Harris likes to use long rectangular “spears” of ice, that are about 1 inch wide and 4 inches long. “It’s a very cool presentation” and also works well with the drink as it melts slowly, he notes. There are occasions for shaved ice. 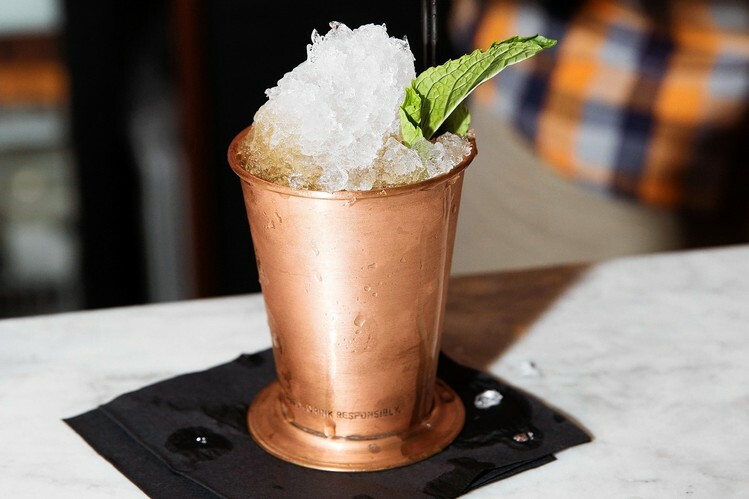 Stiff drinks such as mint juleps need dilution from fast-melting ice in order to be “palatable,” Mr. Harris says. Generally he only uses shaved ice for strong cocktails. When adding flavor using ice cubes, Mr. Harris likes to complement what’s already in the glass. “Watermelon cubes go fantastic with any white spirit. You could add it to white rum, gin, vodka, a little bit of citrus and a little bit of sugar,” he says. Watermelon cubes are also festive: Hosts can set out flavored cubes along with white spirits like tequila, vodka and gin, as well as mint and citrus juices, so that guests can make their own cocktails, he notes. Whiskeys, aged tequilas and dark rums tend to go better with “winter flavors” such as stone fruits, ginger, peach and apples, Mr. Harris says. He makes an apple juice-and-ginger ice cube that goes with Scotch. “You get a very wintertime, spicy, almost Christmas-y drink,” he says. Square ice cubes about an inch and a half high work fine in most cocktails, Mr. Harris says. But he makes sure they have perfect clarity, often using filtered water for a “clearer, more translucent ice cube than non-filtered tap water.” Another trick for making ice cubes clear is to start by pouring in warm water instead of cold. Once the ice is made, Mr. Harris says make sure it doesn’t stay in the freezer too long. “If you have a packed freezer with a ton of food, it’s going to start pulling some of those flavors into it,” he says. Unless the freezer contains only ice, he generally tosses unused ice out every two to three days. Puree Watermelon and strain seeds. Freeze in any shape. Mix lemonade and put in freezer trays with thyme sprigs and freeze. Muddle lemon and mint in mixing glass; add ice, syrup and gin. Shake and strain over watermelon cube into collins glass. Top with Prosecco. Garnish with mint sprig. Build in collins glass over lemonade thyme ice cube and top with soda. Garnish with lemon twist and fresh rosemary.